Nick’s Annual Turkey Drive is here again! Once again, it’s time for our (7th) annual turkey drive! On Sunday Nov. 22nd, I will be delivering turkeys to Phoenix Rescue Mission as they prepare to feed the homeless on Thanksgiving Day. I believe that many people have a desire to help others this time of year but find it difficult to do so because our lives are so busy. This year, the shelters need a LOT of help. If you would like to help by making a financial donation, we will do all of the work for you! 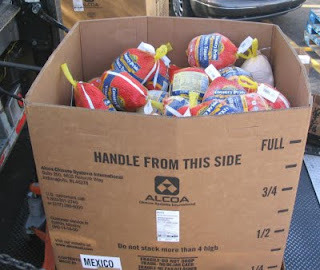 I’ll be purchasing frozen turkeys Sunday morning to deliver to the Phoenix Rescue Mission. (I can provide receipts from the mission if needed.) Please feel free to contact me with any questions or donations. If you are able to donate one dollar or a hundred ( or more), I am able to purchase frozen turkeys all at once for delivery to the mission on Sunday morning. Last year, with the help of my friend Rob, we were able to deliver over 875 pounds of turkey for needy families! Big thanks to Rob Sell at Sell Home Inspections for all he does. Thankfully, Rob has really stepped in to be a huge help to me in hauling all of these birds. We both have a BLAST delivering them and want to thank everyone for your donations to such a great cause. Please help. Every single penny is GREATLY appreciated. We want to make it easy for everyone to help others this Thanksgiving. I would also like to wish you and your families a wonderful holiday season!